This Competition Clutch Stage 2 - Street Series 2100 Clutch Kit assembly provides approximately 80% increase in torque capacity and is properly suited for aggressive street use and moderate track use. The Carbon Kevlar material with its alloy backing matched to a performance pressure plate will provide smooth engagement and extended life. 500 mile break-in highly recommended with this set-up. 300 mile break-in REQUIRED with this set-up. 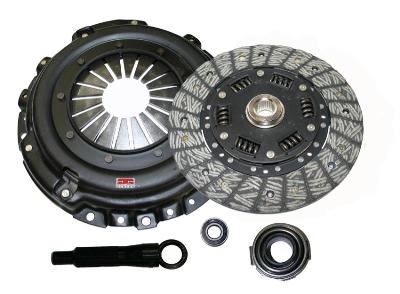 The Competition Clutch Stage 2 - Street Series 2100 Clutch Kit includes a performance pressure plate, a high torque sprung disc with antiburst steel backed Carbon Kevlar facings, all applicable bearings, and the appropriate alignment tool. Competition Clutch Stage 2 Street Series for the Subaru STi.